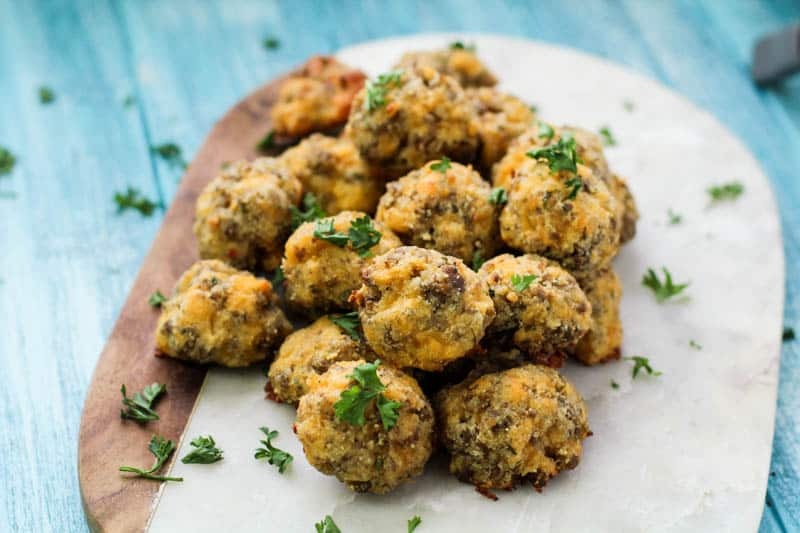 I’m so excited to share this Keto Sausage Balls Recipe with you! I have taken an old family favorite recipe from back in the day and perfected it to fit our Keto lifestyle! And guess what?!! They came out perfect! PERFECT! It took a bit of tweaking this keto recipe though. It has to have the perfect combination of flours, liquids, and cheese to make them just right. You don’t want them to be too dry. Oh, and here’s the best part. You can switch up the cheeses and the sausage types depending on your tastes. There are different types of sausage flavors like mild, spicy, breakfast, and sage that you can use. 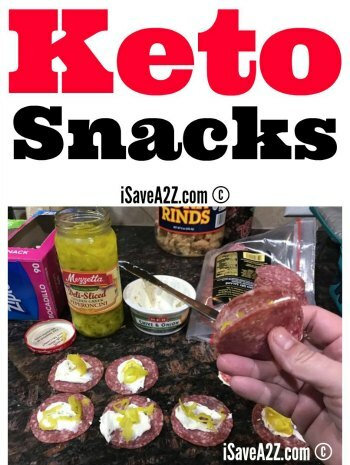 Each different type of sausage changes the flavor of the keto sausage balls too. The cheese types do the same thing. 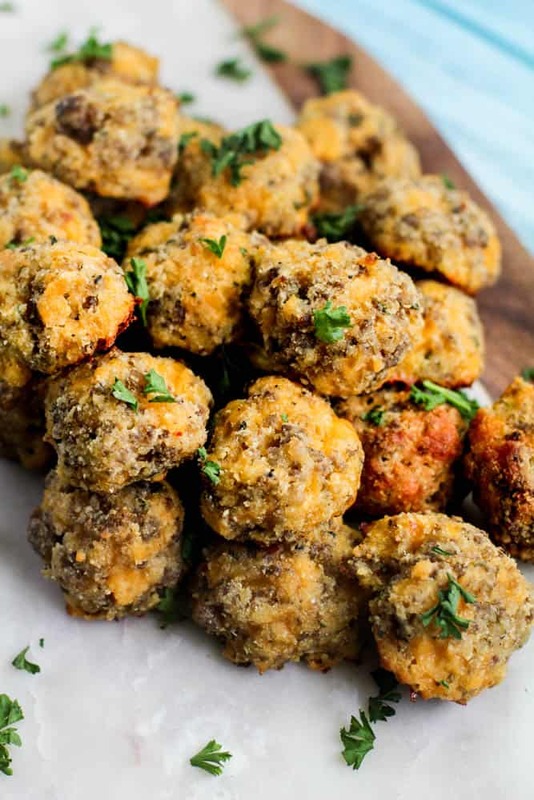 I personally like a Sharp Cheddar and Parmesan cheese mix like this recipe but I’ve also used just extra sharp cheddar in these and love them too. We used to make them with cheddar cheese all the time when I was a kid. 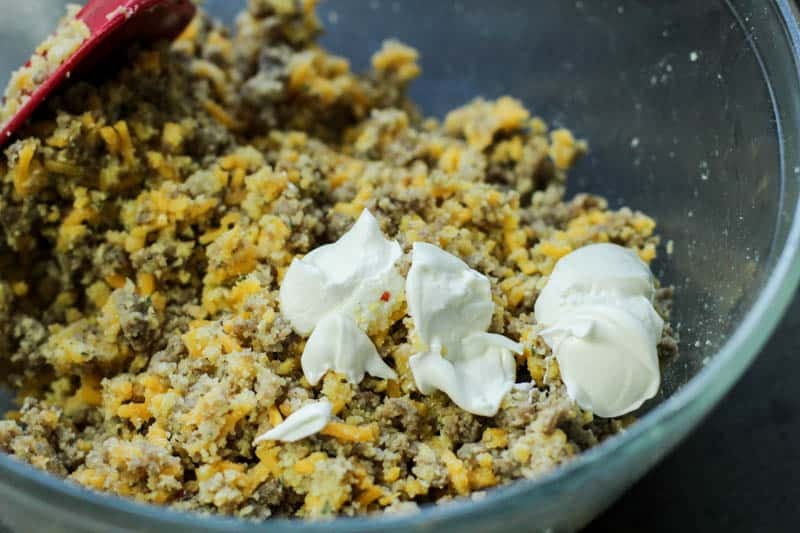 The only other recipe I love as much as this one is our Low Carb Biscuits Recipe that’s Keto Friendly. You all know how popular that recipe is! OMGosh, it’s good! 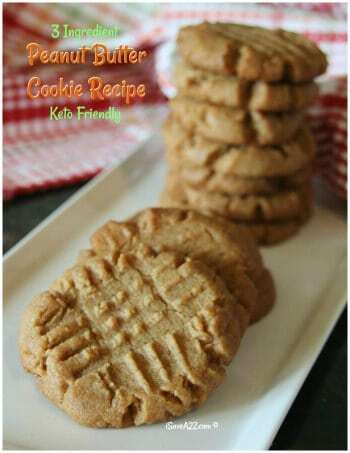 It’s probably are #1 most popular recipe on the blog! I get emails almost daily of readers thanking me for that recipe. Shoot, that recipe is what helped convert me over to the keto way of life for good! We often make those biscuits into this Keto Sausage Biscuits and Gravy recipe too! We love breakfast ideas that don’t need eggs. Parchment paper when you cook them makes for easy cleanup. You don’t have to precook the sausage. I’ve also made them with raw sausage and cooked them like that. 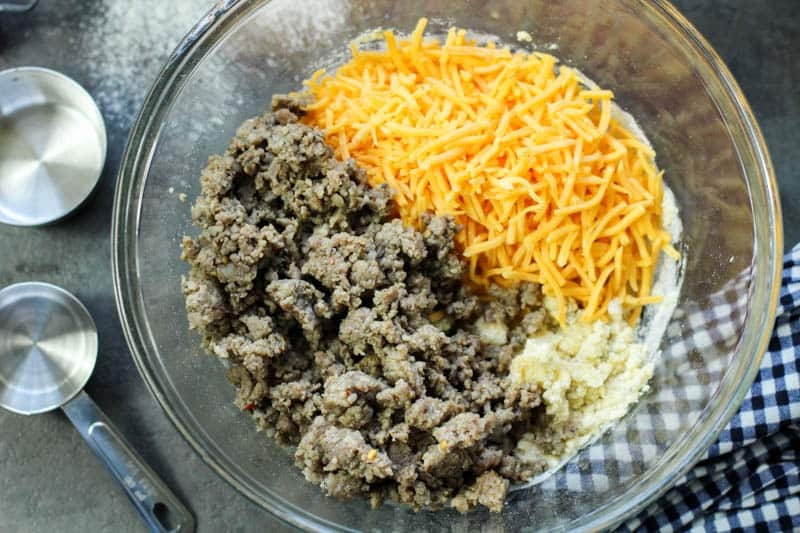 Be sure to mix all the ingredients except the cheese. Mix the cheese in last. It just mixes better if you prefer to do it that way. They will also cook with more grease on the pan so just make sure you are careful when removing it from the oven too. For easy cleanup, use a large baggie to knead the ingredients together. You can use your hands to roll each ball out or you can make it easy and use a cookie scoop if you have one. The ice cream scoop is a bit too big. It’s worth the same investment when you make this recipe often. Here are a few photos we took when we made them! Keto Sausage Balls are perfect for breakfast! 1/4 cup of grated Parmesan cheese or your fav! 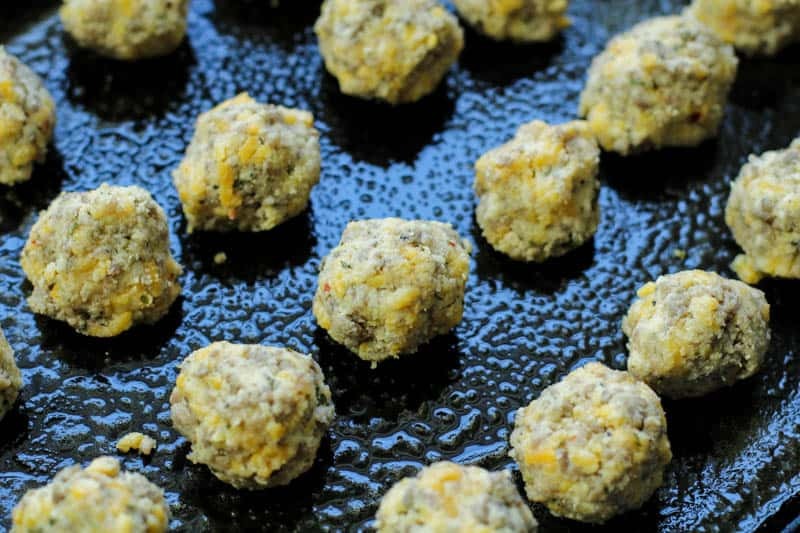 Roll sausage mixture into 1 inch balls. Add to a well-greased pan and bake for 15-18 minutes, or until a light golden color. Delicious recipe that's perfect for breakfast or a keto appetizer idea too! Join our Low Carb Inspirations group on Facebook! 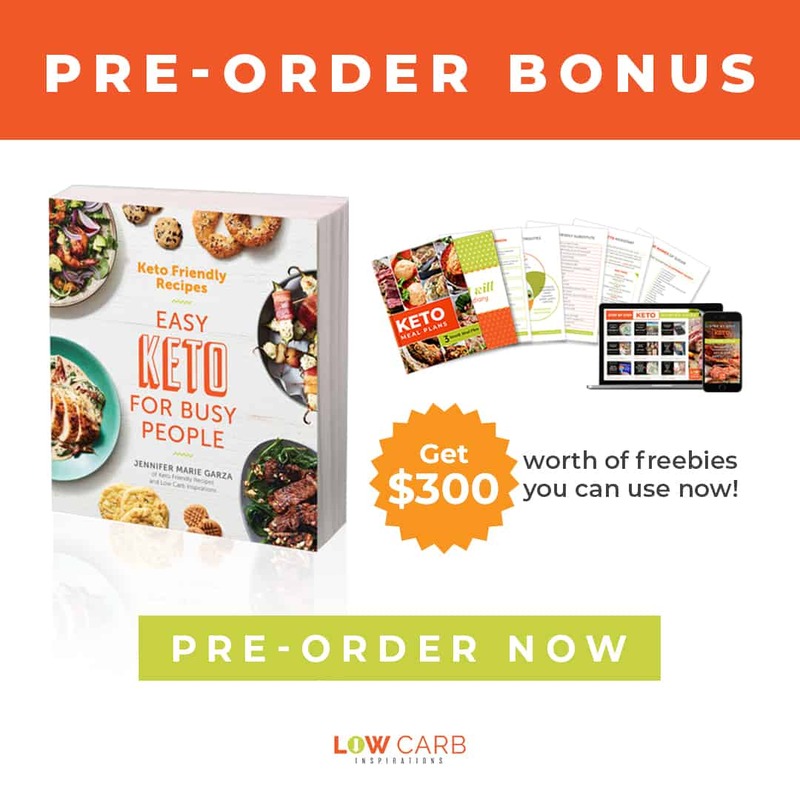 We talk about all the yummy Keto and Low Carb recipes all the time! 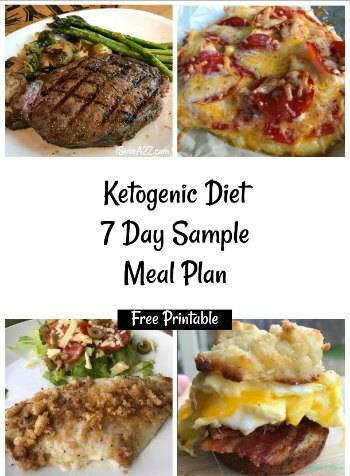 By Neyssa on August 8, 2018 Keto Breakfast Recipes, Keto Friendly Recipes, Low Carb Recipes, Recipes, Weight Watchers.